710 Study San Rafael Neighborhood Posts: Los Angeles: Will The City Of The Future Make It There? Los Angeles: Will The City Of The Future Make It There? GUEST WORDS-When I arrived in Los Angeles almost 40 years ago, there was a palpable sense that here, for better or worse, lay the future of America, and even the world. Los Angeles dominated so many areas — film, international trade, fashion, manufacturing, aerospace — that its ascendency seemed assured. Even in terms of the urban form, LA’s car-dominated, multipolar configuration was being imitated almost everywhere; it was becoming, as one writer noted, “the original in the Xerox” machine. Yet today the nation’s second-largest city seems to have fallen off the map of ascendant urban areas. Today’s dynamic cities in terms of job and population growth are the “new Los Angeleses,” such as Houston, Dallas, Phoenix or Charlotte; at the same time LA lags many more traditional “legacy” cities in job creation and growth, notably New York, Boston and Seattle. Worst of all, LA has lost its status as the dominant city on the West Coast; that title, in terms of both economic and political power, has shifted to the tech-heavy Bay Area. 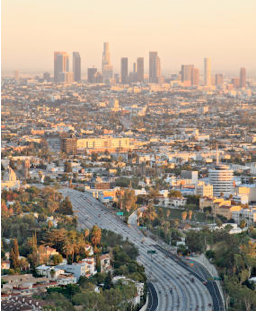 With a weak economy and little media outside Hollywood, the city has lost much of its cachet. A Businessweek survey last year ranked San Francisco as America’s best city to live in. Los Angeles was 50th, behind such unlikely competitors as Cleveland, Omaha, Tulsa, Indianapolis and Phoenix. In another survey that purported to identify the top 10 cities for millennials, Seattle ranked first, followed by Houston, Minneapolis, Dallas, Washington, Boston and New York. Neither L.A. nor Orange County made the cut. LA’s relative decline reflects a collective inability to readjust to changing economic conditions. Some of this has to do with the end of the Cold War, but also with the loss of the headquarters of many of the area’s top defense contractors, such as Lockheed and, most recently, Northrop Grumman. In 1990, the county had 130,100 aerospace workers. A decade later, that number dropped by more than half to 52,400. By 2010, the county’s aerospace jobs numbered 39,100. With the exception of drone technology, the region’s aerospace industry, as one analyst put it, has become “dormant,” a victim of a talent drain and a difficult business environment. This decline has weakened the metro area’s standing as an industrial center — LA has lost almost 20% of its manufacturing jobs since 2007. Meanwhile STEM employment in the Los Angeles-Santa Ana area is still stuck below its 2002 levels; once arguably the world’s largest agglomeration of scientists and engineers, the region has now dipped below the national average in the proportion of STEM jobs in the local economy. In contrast to the Bay Area, whose tech community also was largely nurtured by defense contracts and NASA, LA’s defense and aerospace industries never pivoted into the vast civilian market. Capital, too, has played a role. The LA area has lots of rich people, but a relatively weak venture capital community. For example, the Bay Area was a recipient of roughly 45% of U.S. venture capital investment in the third quarter of 2013, while far more populous Los Angeles-Orange County took in under 6.5%. The growth of VC-financed companies is one reason why LA has been less able to produce high wage jobs than its northern rival. According to a recent projection by Economic Modeling Specialists Inc., high-wage jobs will account for only 28% of L.A.’s job growth from 2013 through 2017 compared to 45% in the Bay Area. Far greater problems can be seen further down the economic food chain. The state’s heavy industry — traditionally the source of higher-paid blue-collar employment — entirely missed the nation’s broad manufacturing resurgence. In the first decade of the 2000s, according to an analysis by the Praxis Strategy Group, LA lagged all but 10 of the nation’s 51 large metro areas in creating manufacturing jobs. Two other once-unassailable economic niches in LA, its port and entertainment, also are under assault. The expansion of the Panama Canal has increased the appeal of the Gulf ports, as do plans for expanded port facilities in Baja, California. These shifts threaten many of the roughly 500,000 generally well-paid blue-collar jobs in the local logistics industry. Then there’s the slow but steady erosion of LA’s dominance in its signature industry, entertainment. Motion picture employment is down 11,000 since 2001. In the same period New York has notched modest gains alongside growth in New Orleans and Toronto. New announcements of industry expansions and an uptick in production in LA show that Tinseltown is far from dead, but challenges continue to mount from overseas and domestic competitors. Perhaps most shocking has been the tepid response to this relative decline among LA’s business and political leaders. Once local entrepreneurs imagined great things, like massive water and port systems, dominated the race for space and planned out the suburban dreamscapes of Lakewood, Valencia and the Irvine Ranch. Arguably the signature achievement of this past decade, and the one getting the most attention in the media, has been the revival of downtown as a residential and cultural hub. Having essentially abandoned the model of a multipolar city, LA has poured billions in infrastructure and subsidies into a half-baked attempt to turn Los Angeles into a faux New York. This is something of a fool’s errand since barely 3% of area residents work downtown, and most cultural consumers live far away on the Westside or in the San Fernando Valley. New Mayor Eric Garcetti is also a density advocate, and is placing huge bets on the massive building of high-end high-rise housing, all this despite weak job and population growth. In his campaign he emerged as the candidate of developers who want to densify the city, including Hollywood, over sometimes fierce grassroots opposition. Compared to his inept and economically clueless predecessor, Antonio Villaraigosa, Garcetti represents something of an upgrade. He at least knows jobs matter at least as much as development deals for contributors. Yet he remains pretty much a creature of the failed leadership culture of L.A., which is dominated by public employee unions, subsidy-seeking developers and greens, largely from the city’s affluent Westside. Can LA turn itself around? The essential ingredients that drove the city’s ascendency remain: its location on the Pacific, its near-perfect climate and spectacular topography. The key now is for the region to build an economic strategy that allows it to use its assets, and build around its increasingly immigrant-dominated grassroots economy. Innovation in music, fashion and food continue at the grassroots level, with much of the inspiration coming from the city’s increasingly racially diverse mestizo culture. What LA needs now is not a slick media campaign, but a concerted effort to tap this neighborhood-centered energy. The city of the future needs to reinvent itself quickly, before it fades further behind its competitors on the coasts and in Texas. Successful cities such as Boston, San Francisco, Seattle and Houston all managed to find ways to nurture new industries to supplement their traditional ones. Los Angeles should be able to do the same, but only if it seizes on its fundamental assets can it again become a city with a future.